I had to do it. Tonight's episode is called Blood of My Blood. Besides it's Sunday and Bloody Marys are kind of my traditional Sunday drink. Plus, I like a good cocktail pun. 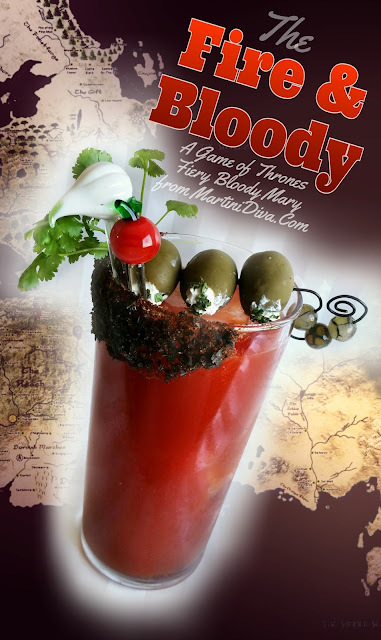 I also like history and historical references abound in Game of Thrones, including comparisons of Melisandre to Queen Mary I of England, aka Bloody Mary. 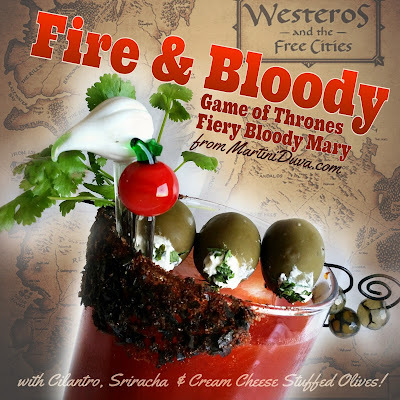 Evidently we're in for some surprises with tonight's episode and surprises on Game of Thrones usually involve some blood so Bloody Marys are appropriate. Rim Ingredients: Black Lava Salt, Chili Powder and Celery Salt. DIRECTIONS: Mix a few dashes of Sriracha, some cilantro and a few dashes of soy sauce in 1 tablespoon of softened cream cheese then stuff this in some green olives. Set aside to garnish the cocktail with later. Coat half the glass rim with some tomato juice then dip in the mixture of Black Lava Salt, chili powder and celery salt. Chill glass in the freezer. Combine ingredients with ice in your cocktail shaker and shake really well to mix the ingredients in with the tomato juice as you chill and dilute. Strain into your pint glass, garnish and serve.